1) In a shallow bowl, whisk together eggs, milk, cream, vanilla and cinnamon. 2) Heat 1 tablespoon butter in a large skillet over medium heat. Dip challah slices in egg mixture, turning to coat thoroughly. Let the slices sit for 3 minutes before shaking off any excess. 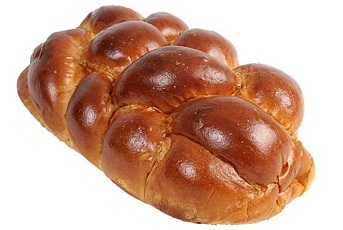 3) Cook challah slices in a single layer on skillet for 2-3 minutes on each side, until golden brown and cooked through. Repeat with remaining butter, challah and egg mixture. Transfer french toast to plates. 4) In a saucepan over medium heat, combine the mangoes, butter, brown sugar, lemon juice, orange juice, and water. Stir until the mixture thickens. Remove from heat and serve over French toast. 4) Transfer French toast to plates and top with mango sauce or syrup or both.